When I checked out one of the new MacBooks, I knew that pressing the trackpad wasn't really clicking physically, but simulating it. But my fingers couldn't tell the difference. The Apple Watch does other interesting touch "feelings". Taps when you get a message. Try to scroll beyond the end of a list with the crown and there's a bouncy feel as it snaps back. It's pretty positive that will be added to the new iPhones next week. I think everyone is thinking about the "Force" part of it, missing the "Touch" part when it comes to iPhones. Buttons that have a "click" feel when you press. Lists that bounce back when you drag them too far. Photos that give a "stretchy" feedback as you zoom in. Games get interesting too, pieces that "click" into place as you drag them. Hopefully the "taptic" hardware can simulate all sorts of interesting feedbacks. There are so many existing apps, plus all the new ones, that writing apps really is like playing the lottery these days. I saw a report (and promptly forgot where) that about 12,000 new games come out each month. Apple features some of those new games each week. And that's really all that matters. Unless you have a lot of money to spend on ads, get very lucky, or do shady things like buying downloads, being one of those featured games is the only path to success. Right now, Apple features about 15. And they do want to mix it up so it is not all the same type: some action games, some puzzles, some driving ones, etc. So you don't have to be in the top 15 out of all 3,000 to get featured, its more like the top one or two out of the style of game you make, so say the top 2 out of 500. 2 in 500 aren't great odds. But the potential payoff if you get that winning ticket is immense. A few years ago, checking your phone while at dinner with someone would've been considered pretty rude. But not so much any more. There's really a formula to it, the more people in the group, the less rude it is to check your phone. It drops quickly to "normal behavior" once the group has 3 or 4 members. Now, checking your watch (Apple Watch) sends the message you have somewhere else to be. But I bet that changes too, as more and more people have watches and devices that show their messages and emails. Glancing at the screen, then getting out the iPhone only if it's something more important than the people you're with. Is the App Store really this fucked? One of our apps, Contact Clean Pro, jumped up to nearly the top 50 in Productivity. The day it jumped up wasn't a particularly good day for it, selling 4 copies. The recent best was a couple weeks ago when it sold 13(! 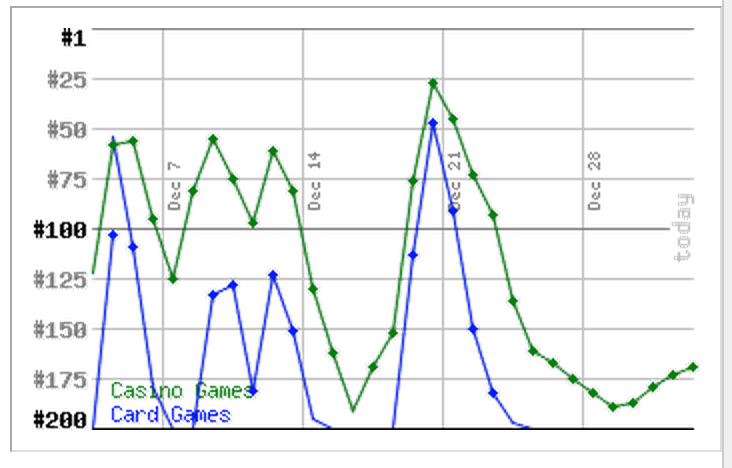 ), about the time it was at very bottom of the top 200 graph above. So for iPhone Productivity apps, any app that is out of the top 200 is selling single digit copies a day at best. 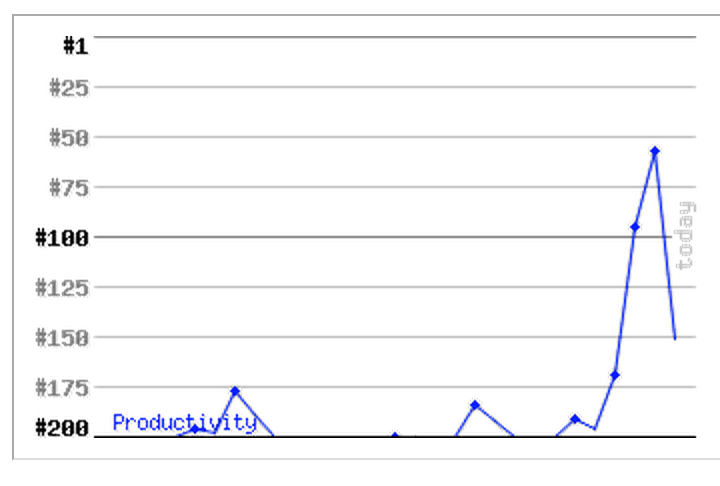 So of the thousands and thousands of productivity apps, most are making virtually nothing. With a very large percent making absolutely nothing. But the lucky 10 or so at the top are likely selling hundreds or thousands of copies a day. I wanted to get an idea for the size of the Apple Watches, so looked for similar every day objects. AAA batteries are a pretty good match! All models of the watch are exactly the same thickness as a triple-a battery. Three AAA batteries together are a little longer and a little thinner than the bigger 42mm Apple Watch. The steel model weighs in the middle between 4 and 5 AAA batteries. The gold model weighs the same as 6 AAA batteries. With faster than light travel, combined with adequate sensors or telescopes, nothing that happens in public--ever--is private or a mystery. Want to see what happened during that battle 2 days ago? Fly your ship 2 light-days away, turn around and with a telescope you can simply watch it happen in real time. We started the TopAppCharts.com website back in July 2009. It doesn't have every app, but has all those that got into any of the US top 200 lists for any category since then. The database says there are over 410,000 apps. That's an interesting stat right there, there's way over a million apps, so well over half of the apps released never got into any US top list and were likely dead on arrival. Apple's App Lookup does not include the "last updated" date, and I wanted to use Apple's public APIs and not scrape the iTunes site, so I had to look at the list of supported devices. Any app that was compiled to support a newer iOS and take advantage of its new features (like those new-fangled Retina screens back in 2010) would lose support for older devices, which gives a rough idea of when the app last had any updates. I can't find dates for some older things, when iOS 4/5/6 support was required for submission. 38,362 or 9% of the apps we know about still support the original iPhone, so haven't been updated since around 2010 and wouldn't support Retina screens. 20,320 or 4% still support the iPhone3G, so haven't been updated since 2011. 137,027 or 33% still support the iPhone 3GS, so haven't been updated since 2014. These would look old-style on iOS 7 and definitely wouldn't take advantage of iPhone 6/6plus screens. So 46% of all the apps tracked by our site haven't been updated since last year at the earliest. And 13% haven't been updated in 3+ years. The huge number of apps we don't have in the database never got into any top selling list since 2009, so I'm sure would be far higher percentage of "dead". There's a good chance those old apps will have some problem with newer iOS versions, so probably won't work on your new iPhone 6 anyway. 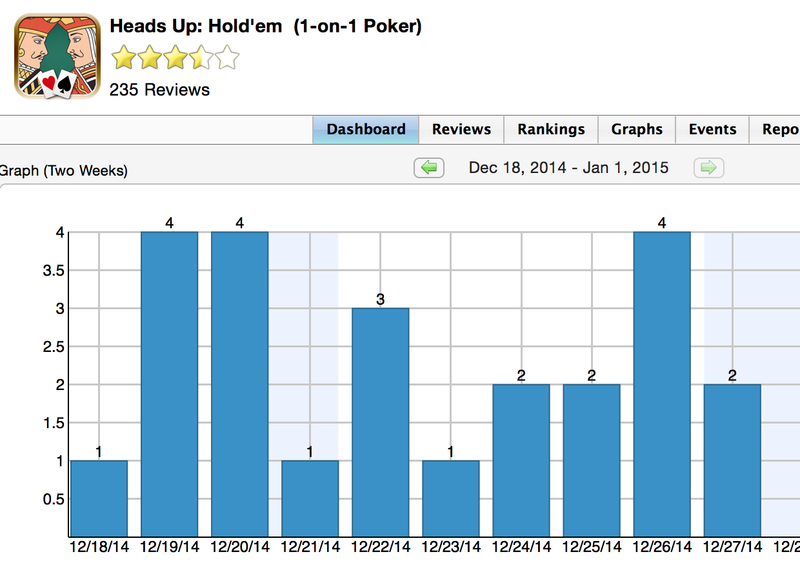 Our Heads Up Hold'em got to the top 25 list in the iPhone Casino games category a couple weeks ago. Surely that means it selling well? Nope. It sold 4 copies that day. There isn't an easy way to see how many apps are in a category any more--but I know there are thousands of games in the paid Casino games. All but 25 must be selling 4 or fewer copies a day. Sad for everyone.